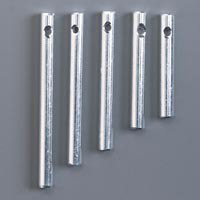 Add a delightful feature to your crafts with these Solid Aluminum Mini Chimes in 2 sizes! Fiskars Soft Touch, Micro-Tip Scissors in Stainless Steel and Titanium! The most comfortable scissors to use, especially for those who have arthritis! Perfect for all crafts ~ especially for plastic canvas! Reduces hand cramping with easy spring action and safety lock. Micro-tip blades for precision and strength. For Left-hand or Right-hand use. 6-inch total length. In Stainless Steel or NEW Titanium Nitride, an extremely resilient blade coating provides excellent durability to resist scratches, wear and corrosion. An essential aid for all crafters! Therapeutic comfort of the supple fabric provides gentle, soothing massage with every hand and wrist motion. Fine interlocking knitted fibers act like a honeycomb to trap body heat, enhance circulation and reduce capillary tingling. These support gloves have been tested and approved by OHNs and RPTs to relieve hand fatigue, pain and cramping associated with arthritis, tendonitis, carpal tunnel syndrome and other repetitive motion disorders. Fingerless design leaves fingers free for full sensation and complete dexterity. Elegant and Sturdy way to thread all your yarns! Threader swivels into antique case for handy storage. 3 Static Cling markers in yellow, green and orange, keep your place in books and charts as you work! Perfect for Needlecrafts, Recipes, Maps and More! Handy Bookmark size. Quick and Easy way to make Pom-Poms of all sizes. 2 Pom-Pom Makers in each pack. Great to use on Planes! Easily cuts yarn without using scissors. Antique Gold Pendant. Handy and easy to use row counter - a must have for crochet and knit projects to keep your place by rows! Great to use to mark your stitches - includes plastic case. Regular Size has 20 markers; Jumbo Size has 12. Used to Fluff up yarn. Especially handy on crochet and knit projects using fur and fashion yarns. then click the "Add to Cart" Button below.